(November 25, 2006) — Hit and Miss, a painting featuring African impalas leaping away from leopards with dining in mind, could be perfect for that space over the fireplace in your rustic hunting lodge when it goes on sale Thursday — if you have tens of thousands of dollars to spare. It's one of 50 pieces to be put on auction by Genesee Country Village & Museum during the next three weeks at Sotheby's of New York City, and the works are expected to bring $2 million. The Mumford museum, a re-creation of a typical 19th-century village, is selling works that don't fit its mission, said outgoing President and CEO Betsy Harrison. "There are 900 pieces in the collection. ... These pieces are primarily African art from the 20th century." By "African art," Harrison means works depicting scenes from Africa. Most were collected by John L. Wehle, the former chairman, president and CEO of Genesee Brewing Co., and the museum's founder. 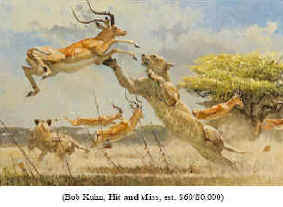 Wehle, who died in 1993, spent a significant amount of time in Africa and accumulated many pieces of wildlife and sporting art, including Hit and Miss, done by Buffalo native Bob Kuhn. Museum curator Patricia Tice made the recommendations as to which pieces might be auctioned, and those decisions were approved by the board of trustees. "We are keeping some of the very finest examples of 20th-century art in the collection," Harrison adds. Three 20th-century bronze sculptures belonging to the museum will be offered at a separate auction by Sotheby's on Dec. 15. The New York State Board of Regents' guidelines for the use of money accrued through such "de-accession" says the assets can only be used to create "a separate fund for acquisition, conservation and preservation," Harrison says. But there is some maneuvering room. The Regents' allowance of "conservation and preservation" would also allow the museum to "put a roof on a historic house," Harrison says. "It's all about how you take care of your collections." And the auction could help nicely on that account on November 30, 2006. It's estimated Hit and Miss could draw between $60,000 to $80,000 in auction. Kuhn, who now lives out West, has been notified that some of his pieces will be moving to a new home. Sotheby's has already sent out word to museums around the world of the availability of the works. For the last news about Hit and Miss you should join our African Art Club and become an insider of the African art market.